MDrill One has just launched a referral program for our backers, which allows them to earn a free MDrill One microphone if they refer five backers to the Indiegogo campaign. MDrill One has exceeded its funding goal by 386% with 296 backers and 10 days remaining of the campaign on Indiegogo. MDrill One is a studio-grade USB microphone that offers broadcast quality audio, meaning it does not pick up any background noise, cracking or popping. MDrill One records 10% more clearly in comparison to other USB microphones, which gives users better quality and consistency every time. They also developed proprietary VERTIGAIN® Technology, which moves sound waves vertically, unlike other microphones, therefore the sound quality is smooth and clear. MDrill uses five different recording modes, meaning users do not have to switch back and forth between microphones for different types of recordings. The five recording modes include bidirectional, omnidirectional, cardioid, stereo and noise reduction. 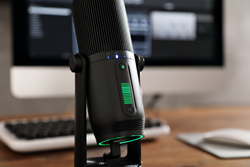 Each MDrill provides zero latency through a USB-C connection and smart recording guarantees that favorite recording settings will save within the microphone. Each MDrill comes with a universal mount allowing users to use pop filters or microphone extensions. The seven color RGB LED adds a colorful element to the sleek design of the microphone. During the Indiegogo campaign, the travel size version of MDrill One, MDrill Zero, is also available. MDrill Zero provides two recording patterns, cardioid and omnidirectional. MDrill Zero is currently available for $89 and MDrill One is currently available for pre-order on Indiegogo for a discounted price of $139. For more information about the campaign, visit bit.ly/MDrillIGG. With a history of audio engineering that began in 2009, Thronmax has developed a passion for making great microphones for the streaming and broadcasting industries. In February 2017, the Thronmax team began working on the first noise reduction studio grade USB microphone. Last October, they finished the first working sample to test. For more information about Thronmax or MDrill One, visit thronmax.com/.